This unit has a max occupancy of 16 people. Under the NC Vacation Rental Act, guests must sign a short term lease agreement. Guests can view and sign their lease agreement by logging on to GuestWeb. From there, guests can add or decline optional packages, sign the lease agreement, save a copy of the lease, and return to review the lease at any time prior to arrival. Please note that the leaseholder must occupy the home for the duration of the stay. A single tenant may only hold one lease for a given time period. The leaseholder must be at least 24 years of age and must occupy the home for the duration of the stay. As agents, our homeowners authorize us to rent to family groups and approved non-family groups only. A family group is defined as one or more families consisting of immediate and extended family members that vacation together in one home. This means no sororities, fraternities, or young groups, with or without chaperoning. Non-family groups are only permitted with special consideration and approval from the homeowner, and require a refundable cash security deposit ranging from $500 to $1,000 which will be returned 45 days after departure. Stan White Realty & Construction, Inc. operates under the North Carolina Vacation Rental Act and will commence an expedited eviction under this law if a home is rented under false pretense. Your advanced payment is due within three days of booking. Partial stays, negotiated or discounted rate reservations, and reservations made within thirty days of arrival must be paid in full the day of booking. Negotiations cannot be made after the first payment is made. Please call us with any special request or delays – reservations not paid within the required time period are subject to cancellation without notification. Travel Interruption Insurance is considered declined if not included with advanced payment, and accepted if included. Once accepted, Travelers Insurance cannot be cancelled. The balance of rent, including sales tax, occupancy tax, and any additional optional packages, is due thirty days PRIOR to your arrival date. Taxes are subject to change and payable by tenant. Unpaid balances over $50 made on the day of arrival will result in a $50 late fee, and payments on the day of arrival can only be made using cash, a credit card or certified funds. Unpaid balances must be paid in full before 5pm on the day of check-in or else tenant will not be permitted to check in. There will be no after-hours check-ins for reservations with outstanding balances. Guests can also use GuestWeb to make payments with a credit card or e-check. There is no processing fee for your first credit card or e-check payment. For each additional transaction, there will be a $29.95 processing fee for credit cards, and a $4.95 processing fee for e-checks. For this reason, we encourage our guests to make their entire payment in full. Guests may also mail personal checks up to thirty days before their arrival date. We cannot accept personal checks within thirty days of check-in. There will be a $25 service charge for returned checks, upon which payment must be overnighted in certified funds or reservation will be subject to automatic cancellation. Please note that even if you plan on using another payment method, we require a valid credit card on file for security purposes in order to hold your reservation. All payments must be made in U.S. funds. A booking fee will be assessed on each reservation, due with your advanced payment, and cannot be waived or refunded. Cost for any intentional or malicious damage, damage caused by negligence, pet damage, trash removal, arranging furniture back to original position, or any unnecessary expenditures (including nuisance service calls) incurred during or resulting from the duration of this lease will be charged to the credit card provided upon reserving. There is a $175 fee for reservations that must be cancelled after a signed lease or payment has been received. Notice of cancellation must be provided in writing from the leaseholder prior to the arrival date. Transferring your reservation from one house to another, or dropping a week from a multiple week reservation, is considered cancellation and any previous payment would be split. Fees are applicable on both weeks. If the home is re-rented for any part of the duration of the cancelled reservation, a refund will be issued for the time period the property re-rents. That amount, less travelers insurance, the administrative fee, any difference in rent, and the $175 cancellation fee, will be returned to the leaseholder within forty five days after receipt of payment from the new guest is received and processed. If the home cannot be re-rented during the time period of the cancelled reservation, all funds received are FORFEITED and any remaining balance is due immediately. Changing the date of stay for the same home and for the same rental rate and year is considered a transfer and will result in a $75 plus tax transfer fee once the request is received in writing and approved. A transfer cannot be requested within thirty days of arrival and will be considered a cancellation. Partial stays (less than a full week) are available for many of our rentals. There is a three night minimum. Online booking for off-season (September thru May) partial stays is available for some properties. For all other properties, and for in-season (June thru August) partial stays, owner approval is required and the reservation must be booked over the phone. Partial reservations must be paid in full the day of booking. Most homes in the Carolina Club Linen Program do not provide linens during partial stays, however, linen packages can be purchased for an additional fee. All of our homes include pillows, comforters, and mattress pads on beds. Sheets, pillowcases, and bath towels are ONLY included with Carolina Club homes and Special Event reservations. Beds will be made upon arrival in Carolina Club homes and for Special Event reservations (excluding bunks, trundles, futons and sleeper sofas). Most Carolina Club homes do not provide linens for partial stay reservations - only full week reservations. When booking a partial stay at a Carolina Club rental, please inquire as to whether or not the home will provide linens. For homes that do not include linens, an optional package can be purchased for an additional charge that will include sheets, pillowcases, and bath towels. This option will be automatically included on your lease agreement – you must decline this option on your lease in order to remove this charge. Once paid for, the optional linen package cannot be cancelled. Optional linen packages will be delivered no later than 10pm on check-in day. Bed-making is not included with the optional package, but can be added for a fee – be sure to make this request at the time of purchasing the package if you would like the beds made prior to arrival. Please note that neither the Carolina Club homes nor the optional linen packages include beach towels, kitchen towels or bedding for additional sleeping options (including but not limited to sleeper sofas, futons, trundles and rollaway beds). If you will be requiring more bed and bath linens than what is included in your optional linen package or Carolina Club linen package, you may order them online. Travel Interruption Insurance is offered for those who want financial coverage for their vacation in the case of an unexpected event, such as a death in the family, medical emergency, or a mandatory evacuation. Stan White Realty & Construction, Inc. offers Travel Interruption Insurance by automatically including the cost of the policy in the reservation total. Initial in the space provided on the lease agreement to purchase the policy. To decline the Travel Interruption Insurance, leave this space blank and the charge will be deducted from your total. Travel Interruption Insurance is considered declined if not included with your advanced payment, and accepted if included. Once accepted, Travel Interruption Insurance cannot be cancelled or refunded. Please keep in mind that per the North Carolina Vacation Rental Act, Agent is unable to offer refunds or relocations due to mandatory evacuations and/or damage caused by storms that would otherwise be covered by the Travel Interruption Insurance. For this reason, we strongly recommend that our guests purchase the Traveler Interruption Insurance, especially those booking during Hurricane Season, so that they can be reimbursed in case of these very potential circumstances. Your vacation home is available for you to check-in at 4pm on your arrival date. Please be aware that no keys will be released prior to 2pm, with the exception of early check-ins (see below). The lease takes effect at 4pm on the check-in date specified on the lease agreement and occupancy will not be granted until then. Failure to comply will result in a charge of an additional day’s rent. If you plan on arriving before this time, please request Early Check-In, or make plans to visit the many local attractions on the Outer Banks. We do not recommend grocery shopping until after you’ve checked in to your house. Do not go on the premises or park your cars at the home you are renting before 4pm. This delays the cleaning, inspection and maintenance, and ultimately, your check-in. Two sets of keys will be provided, and additional sets can be purchased for $5.00 each plus tax. If you plan to arrive after 5:30pm and you are paid in full, please contact your check-in office for instructions. After hours check-in is not available for reservations with a balance owed. Guests who have not paid in full must check in during office hours to pay their balance before keys will be released. Guests can arrange for Early Check-In at 1pm for $100.00 plus tax. This fee is due with your balance payment and once paid, will not be refunded if you are unable to arrive by 1pm. Early Check-in is available on a limited basis and is only offered on homes with four or less bedrooms. Even with Early Check-In, pools and hot tubs will not be ready for use until 4pm. Please keep in mind that Early Check-In cannot be guaranteed due to situations that may arise (owner stays, maintenance, extra cleaning, etc.) that are beyond our control. While we will make every effort to honor your request, it may not always be possible and your Early Check-In fee will be refunded if an uncontrollable circumstance occurs. Check-out is at 10am. Guests can arrange for Late Check-Out at noon for $100.00 plus tax. This is offered on a limited basis and is only available for homes with four bedrooms or less. Late Check-Out must be arranged prior to your arrival and the fee is due with your balance payment. Upon 10am (noon for late check-out)), the leaseholder and their guests may not re-enter the property or occupy the premises. The property should be left clean and in good order for the next guests. Pools: Private pools are open from 5/19/18 thru 10/13/18, unless otherwise noted. Pools and hot tubs are serviced on turnover day and will not be ready until 4pm. A chemical check is done mid-week. Most community pools are open from Memorial Day to Labor Day. Unexpected closures and changes of opening and closing dates for community pools are at the discretion of the homeowners association or complex management, and not the responsibility of Stan White Realty or the homeowner. Homes with pools that can be heated will include a notation in the amenities section. There is an associated cost with heating the pool, which varies by home. We have heard that occasionally a mild ground current has been experienced in some pools in both Dare and Currituck Counties. This appears to be the result of the Earth's own natural electrical current rather than a pool defect or household current. Locations of certain properties may be affected more than others and the currents tend to be intermittent. We want to advise you that certain devices such as pacemakers and other similar devices may be affected. Please follow all safety instructions. Fireplaces: Available November 1st thru April 1st, unless otherwise noted. Propane is supplied for gas fireplaces. Wood for wood burning fireplaces is not supplied. Elevators: Please follow all safety instructions posted. Children are not allowed to ride or operate the elevator unattended due to the risk of serious injury or death. Elevator doors should remain closed at all times, except when entering or exiting. Internet Access: Many homes provide internet access for guests. Unless otherwise stated, the internet connection is wireless and there is no computer provided at the property. Guests should bring a network cable to connect laptop to modem. Tech support is only available from local provider on their help line. No refunds will be made if service is unavailable or interrupted. Grilling: No grilling is allowed on wooden decks. This is prohibited and is grounds for eviction. It is tenant’s responsibility to clean grill after use. Please be aware that amenity availability is subject to change due to damage, malfunction, or other unexpected issues that may arise. We will do everything we can to rectify the situation, however, this may not be possible under certain circumstances. No refunds or relocations will be offered due to unavailability or malfunction of amenities. Starter Kits, compliments of the homeowner, are provided in every property and include a roll of paper towels, a roll of toilet paper, dish detergent, laundry detergent, hand soap, and a trash can liner. Other than the items provided in the Starter Kit, no other paper products or detergents are provided. Please review our Things to Bring page. Sheets, pillowcases, and bath towels are not included (with the exception of Carolina Club homes) but can be rented for a fee that varies depending on the size of the home. This optional linen package will be automatically included on your lease agreement but can be declined. Furnishings and decor reflect the personality of owners. Specialty items vary. Do not rearrange furniture! If your group is renting more than one home, do not mix the furnishings. Most homes have an Owner’s Locked Closet. Tampering with locked closets will result in charges to credit card. Your vacation rental home is cleaned for you before and after your arrival. This service is included in the weekly rental rate. Upon request, we can also clean mid-week or between multiple weeks for a nominal charge. The cost varies per house and must be arranged with our office at least ten days prior to check-in. The North Carolina Vacation Rental Act requires tenants to maintain dwelling unit such as “Keep that part of the property which he or she occupies and uses, as clean and safe as the condition of the property permits and cause no unsafe or unsanitary conditions in the common area and remainder of the property that he or she uses. Keep all plumbing fixtures in the property or used by the tenant as clean as their condition permits". Failure to leave the property in a habitable condition may result in a charge to your credit card. It is the tenant’s responsibility to clean grill and dispose of tenant’s trash, as well as any cigarette butts or dog waste, in a proper manner prior to check-out. Properties that allow pets are designated as Pet-Friendly. Unless the property is designated as Pet-Friendly, no animals are permitted on the property. For Pet-Friendly rentals, pets are limited to adult dogs only, with a $150 plus tax fee for up to two which is nonrefundable once paid. Permission to bring more than two dogs must be obtained from homeowner prior to arrival and will require an additional fee of $150 plus tax per dog. Tenant is required to clean up after pets, including surrounding property if necessary. Dogs are not permitted in pools and/or hot tubs. Pets in non-pet properties will result in immediate eviction, loss of rent, and a minimum charge of $250 for violation of this policy, as well as costs associated with any additional issues resulting from this violation. All pets staying in pet-friendly homes must be paid for and claimed on the lease agreement. Puppies, cats, and other animals are prohibited. Leash laws vary from town to town. Please keep in mind that even if a property isn't designated as pet-friendly, there is no guarantee that a pet has never entered the home. Every effort is made to see that these homes are smoke free. Smoking in a non-smoking home is considered damage and is grounds for immediate eviction, as well as loss of rent. This is the responsibility of the leaseholder and will result in a minimum charge of $250 for violation of this policy, as well as costs associated with any additional issues resulting from this violation. Local law is very strict on occupancy limits. Occupancy limits are based on septic permits for each property. In most cases, this is determined as two per bedroom. Bedding is advertised as a point of reference only. Children are counted in total occupancy unless they are age two or under. Tents and other free-standing structures, including campers and motor homes, cannot be kept on the property for the purpose of extra sleeping. Some communities do not allow parking of any vehicles on the street. Over-occupancy is a violation of your rental agreement and will cause an expedited eviction as allowed by the Vacation Rental Act of North Carolina. Approval must be obtained prior to making your reservation. A non-refundable special event fee will be assessed, which varies by property, and a $1,000 security deposit is required, due with the balance payment and returned to you 45 days after departure. A Special Event Addendum must be signed by the leaseholder. Maximum occupancy for events varies by home and is strictly enforced. Please contact our reservations department for details. 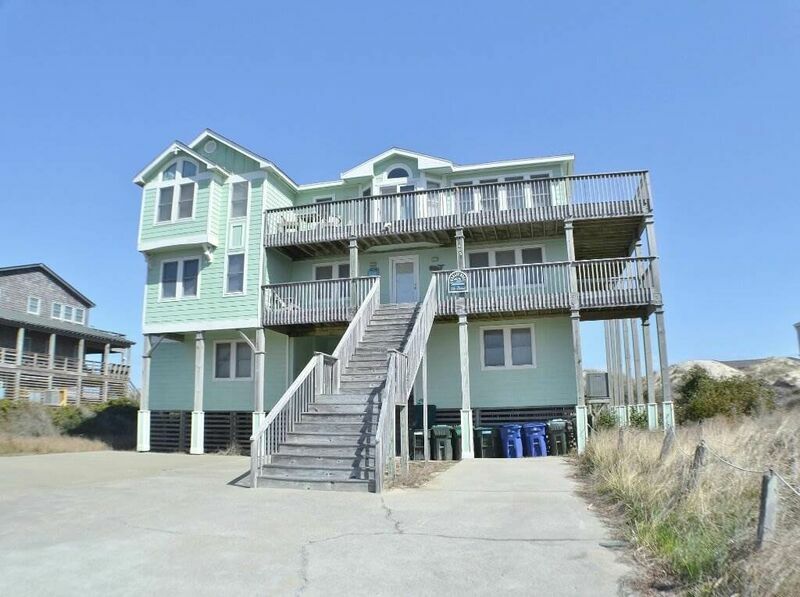 To assist in preserving the quality of life, valuable time with family and friends, and our “get-away from it all" atmosphere, we encourage our guests to consider limiting the number of vehicles they bring to the Outer Banks. With your assistance we can try to reduce traffic and preserve the beautiful environment. There is no municipal or on-street parking in most areas, and this is strictly enforced. No parking is allowed on grass and/or septic fields at the rental property or surrounding properties. Because many of the homes in Corolla and Duck rely on well water, the water quality varies in these areas. It is advisable to stock bottled water for drinking during your visit. While the water is perfectly safe for consumption, showering, etc., it’s probably not what you’re used to, even though most of these homes have water treatment systems. Please be advised that clothes washed in this water may become discolored. Agent has no control over the water quality and there will be no relocations or refunds in regards to this matter. Every effort is made to keep all equipment in good working order. Contact our office within twenty four hours of your arrival to report any observed damage or problems to prevent tenant liability. Agent is not responsible for the working condition or malfunction of equipment such as TV, VCR, STEREO, A/C, etc. Agent has no control over service schedules of power, cable, phone or electric companies. Repairs are made as soon as possible. No refunds or relocations are guaranteed for malfunction of this equipment. Independent companies service pools and hot tubs weekly. Maintenance services required as a result of intentional misuse by guests will be charged to the leaseholder’s credit card. If it is found that a guest reports a problem and nothing is found by the vendor, the guest will be responsible for the trip charge. Please report maintenance issues during office hours. Only emergencies will be dealt with after hours. All other issues will be addressed the following morning. As our area continues to grow, we cannot predict or control new construction, demolition or condemnation of surrounding structures. As Stan White Realty has no control over such situations, there will be no relocations or refunds regarding this matter. We have made every effort to assure all descriptions and information in print and online are accurate; however, we are not liable for errors or changes made by owners in regards to furnishings, amenities, bedding arrangements, or rates. All distances to the beach are approximate and intended for reference only. I have read and agree to the Vacation Rental Policies and the Vacation Rental Agreement (as applicable to this reservation). Expect the unexpected! Protect your travel investment today!